Motherwell crashed 2-0 to champions Celtic in a Scottish Premiership clash on Saturday but they restored pride after two recent heavy defeats at Parkhead. Celtic’s first chance after two minutes saw Liam Henderson shoot just wide after Keith Lasley had been dispossessed. 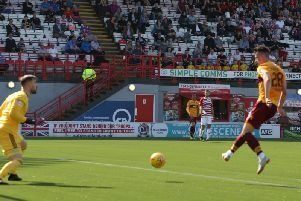 Stuart Armstrong then had an effort deflected wide before Motherwell broke to the other end and Richard Tait’s cross from the right ran to Louis Moult, whose shot was deflected for a corner. More Celtic pressure saw Kieran Tierney’s effort blocked by Ben Heneghan and Mossa Dembele’s shot turned wide by Craig Samson, who then saved an Erik Sviatchenko header after the flag kick had been swung over. But Celtic did go ahead on 18 minutes when James Forrest’s cross from the right was missed by Dembele but Scott Sinclair shot home emphatically. After Henderson had been booked for a foul on Cadden, Celtic won a corner which resulted in Sviatchenko shooting over. ‘Well’s Tait had a low shot stopped by Gordon in a rare foray by the Steelmen, before Dembele was unlucky to shoot against the right post. Tierney then nearly brought the house down with a slaloming run past Motherwell defenders before shooting against the bar. Samson made a wonderful stop low to his right to save Scott Brown’s 52nd minute shot and the hosts soon went close again when Sinclair’s effort went inches wide. Moult had a great chance after a ‘Well free-kick into the box but headed weakly at Gordon. And the English forward missed another fine opportunity when he shot softly at Gordon after brilliant set up work by Cadden. Samson saved a Forrest shot after the away defence had parted, before Brown was booked following an altercation with Cadden on the far touchline. Samson made another brilliant stop from Dembele after the Celtic forward had played a one two with Sinclair. ’Well kid Ross McLean’s fine run up the left then set up Ryan Bowman at the back post but he volleyed over. The out of sorts Moult then disappointingly headed wide after Tait’s free-kick. And the Steelmen paid for this miss when Celtic wrapped up the points with an 85th minute penalty slotted home by Dembele. The award was a disaster for Motherwell defensively as Samson brought down Dembele after rushing out after the away rearguard had let the ball run through.